The Authenticode File action enables you to automate Authenticode signing of your executable files during your build. 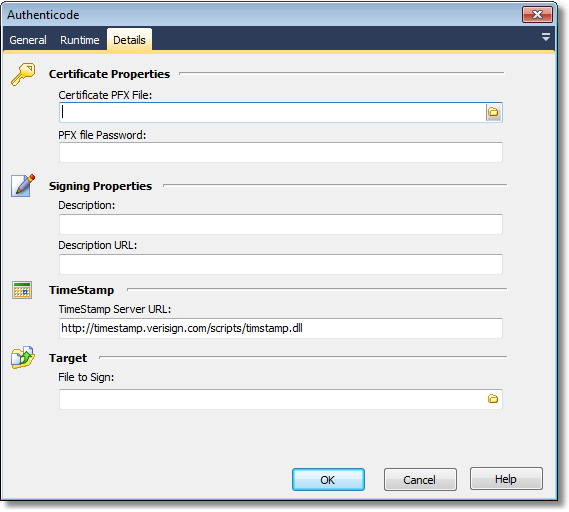 This action requires your Authenticode Signing Certificate to be in a PFX file. Many CAs provide certificates in two files: an SPC and a PVK. See below for details on converting these to a PFX file. To make the PFX, you need to use a Microsoft tool called PVKIMPRT. PVKIMPRT is included as part of the Windows Platform SDK, or can be obtained directly at http://office.microsoft.com/downloads/2000/pvkimprt.aspx. (Replace the mycert and mykey file names where required). You will be prompted to enter your private key password (if set.) A dialog will appear with the certificate export wizard. Make sure you select 'Yes, export the private key', and 'Include all certificates in the certification path if possible' options. You are then prompted to enter a password: this is the password you will use for code signing with the created PFX (it should be secure.) Finally, you will prompted for a location to save the new PFX file. This action includes source code from StreamSec. Its license is reproduced here. * Neither the name of StreamSec nor the names of its contributors may be used to endorse or promote products derived from this software without specific prior written permission.